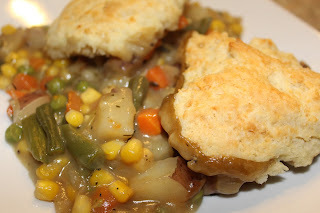 Pot pie is a huge hit in our house. It's something that I can easily make for everyone - vegetarian for me and meat for the family. It's fairly fast to whip up, full of veggies and so comforting! 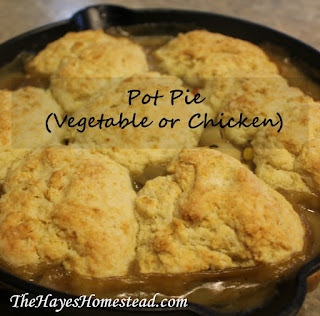 This is one recipe that I get some help from frozen veggies from. You could definitely use all fresh (and I have, and it's even more delicious), but all the washing, peeling, chopping, etc. just adds a lot more time. And, this tends to be a meal I make on nights where I don't have a whole lot of time. This is just my basic recipe - feel free to change it up! 1. Preheat oven to 375. Heat a large skillet (I use either a 10 inch or 12 inch cast iron pan that I bake the pot pie in as well) over medium heat and add the butter. If using chicken, add the chicken and cook until it is almost cooked through. Add the potatoes and onions and coat in the butter. Cover with a lid, lower the heat to medium low and allow the potatoes and onions to steam and cook, stirring occasionally, until potatoes are just beginning to be tender. 2. Add in the frozen veggies, thyme, salt, and pepper and stir to combine. Add another tablespoon of butter and, once melted, sprinkle the flour over the veggie mixture. Coat all the veggies with the flour and cook until you can no longer see the flour, about 5 minutes. 3. Add the vegetable broth, scraping any bits off the bottom of the pan, and bring to a simmer. Once simmering, turn the heat to low and allow to simmer until nice and thick with a gravy-like consistency. 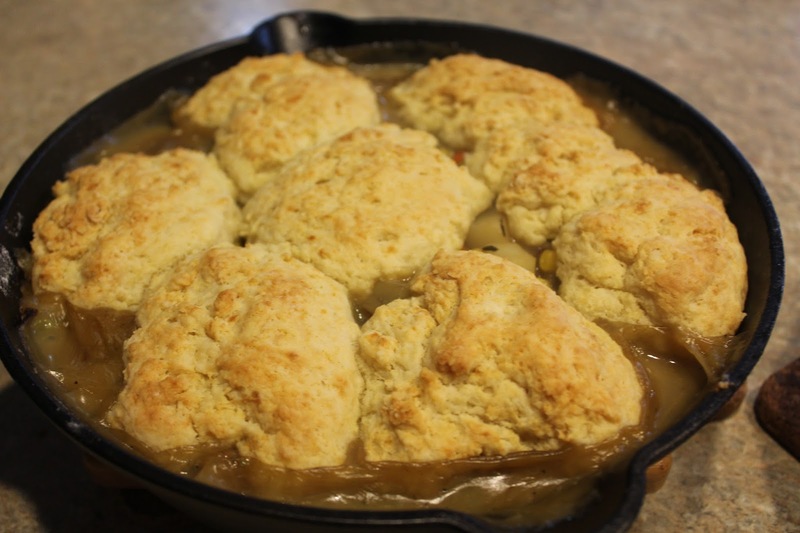 Top the pot pie filling with the drop biscuits (if transferring the pot pie to another baking dish, do so before topping them). Bake for 25-30 minutes, until pot pie is bubbly and biscuits are brown. Serve and enjoy!